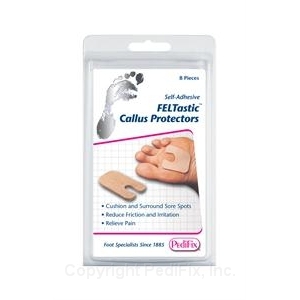 The PediFix FELTastic™ Callus Protectors™ comfort and protect calluses, blisters, and other foot irritations. The PediFix FELTastic™ Callus Protectors™ comfort and protect calluses, blisters, and other foot irritations. Absorb pressure and friction to ease pain and help prevent callus build-up. Self-adhesive backings allow positioning on skin or inside shoes. Scissor-trim for a custom fit. Protect sensitive areas on heels, toes and ball of foot.